You’ll need to take a deep breath before you say the name of the car I’m driving this week, the 2018 Infiniti Q50 Red Sport 400. What it lacks in brevity, though, it makes up for in two key areas: technology and thrills. Stomp on the gas pedal and its 400-horsepower, twin-turbo V6 very loudly reminds you that Infiniti knows how to get drivers’ hearts pumping just like the tuned Germans. And while I wouldn’t call it a direct competitor to the pricey M and AMG monster cars from BMW and Mercedes-Benz, the quick Q50 puts a unique twist on the performance-luxury segment with its own personality. First, it lets technology take center stage, perhaps even more so than its snarling engine. Fine-tuning the driving feel of this car isn’t something done by mechanics turning wrenches in the wheel wells but instead by the driver on a digital screen, whenever they like. Choosing your preferred driving feel is almost like playing a video game. Want the steering to feel different? With the optional Direct Adaptive Steering — part of the $2,700 “proactive package” on my test car — you can adjust the steering feel and feedback because the entire system is electronic. This steer-by-wire system feels different from most cars as it lacks a direct mechanical connection to the front wheels, and you can sense that. It can also reduce the amount of vibration the driver feels from the road, something Infiniti says can help cut down on driver fatigue. 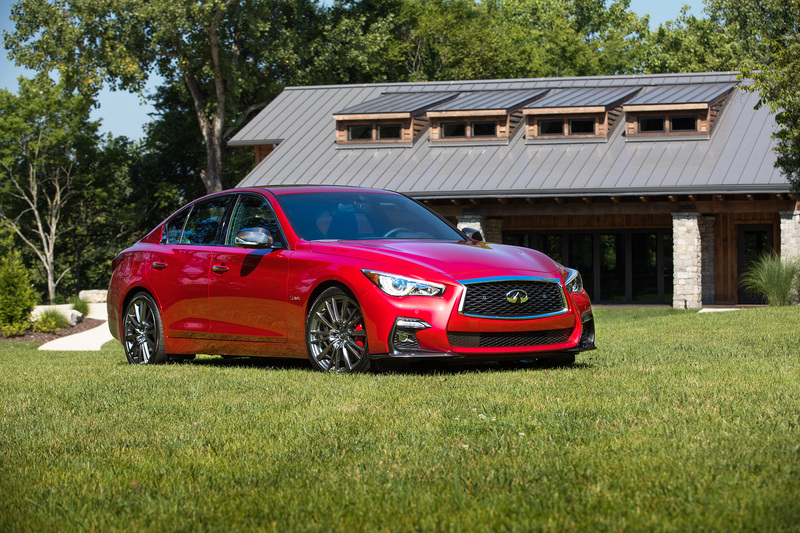 Infiniti’s Q50 Red Sport 400 lets drivers dial in their preferred driving feel from the electric steering and adjustable suspension stiffness, among other settings. Whether that’s good or bad, though, depends on how much of a purist you are. Personally, I like those steering vibrations. I enjoy feeling connected to the front tires, especially on a performance car like this. Perhaps that’s why Infiniti keeps the electric steering as an option even on high-end models. Infiniti also offers an adjustable Dynamic Digital Suspension, which lets the driver tweak the ride from soft and compliant to stiff and aggressive in Sport+ mode. Driving in a straight line, the differences feel subtle. But when flinging the car through corners, the Sport+ setting keeps the vehicle dramatically flatter as the weight shifts, making it feel like a much more nimble, sporty car than it does in the comfort setting. Body roll is all but eliminated. With all the digital toys, plus semi-autonomous driving features that help it follow the speed of traffic and stay centered in the lane, at times the Q50 feels like you’re along for the ride instead of fully in control. One example: Infiniti’s Distance Control Assist feature gently reminds you, the driver, when you’re doing something stupid like following too close to the vehicle in front of you. It feels like a tailgating hall monitor constantly watching your habits. A curvilinear motif makes Infiniti’s contemporary cabins stand out. Quilted trim on the seats adds to the high-end look and feel. If you’re riding someone’s bumper, the car will pull back on the accelerator pedal as if telling you, “Back off, buddy. Don’t get too aggressive.” You feel it in your shoes. And however smart it is, having a machine giving you tactile feedback on your bad driving habits can be disconcerting. As a whole, though, the Q50 Red Sport 400 feels unusually smooth and light for this class of car. It lacks the Teutonic heft of the Germans, or even the built-from-stone sensations you get from a Lexus GS. Instead, it seems to be aiming for performance that’s more about crisp handling than prodigious lumps of power. Not that the twin-turbo V6 is a slouch. This feels and sounds like one of the quickest cars I’ve driven this year. Also, just like with the newly designed QX30 I tested a few weeks ago, I love how Infiniti is avoiding the follow-the-pack mentality that pervades many interior styling departments. The Q50s cabin is truly unique, with interesting, swoopy creases and curved lines that stand out amid a sea of bland, minimalist interiors that somehow pass as “luxurious” these days. Pricing starts at $34,200 for the Q50 2.0t and ranges all the way to $53,000 for the — again, take a deep breath — Q50 Red Sport 400 AWD. It’s a performance car that shows off not just with raw performance numbers but also with cutting-edge technology. It offers a uniquely styled and engineered twist on the classic sports-sedan formula.